AVL Scarefest was an absolute blast this year. The year before was great fun, but this year exceeded my already high expectations. For the uninitiated, AVL Scarefest started as a spooky Pathfinder Society game night at our FLGS the Wyvern’s Tale. GMs and players were encouraged to wear costumes and play the more Halloween-themed scenarios. This was such a hit, it quickly out-grew the ample gaming space at the tale. In 2015, some intrepid Asheville Pathfinder Lodge members started organizing a con to be held in the nearby idyllic and yet somehow spooky Montreat conference center. 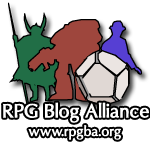 They invited GMs and players from far and wide to run all manner of spooky games. Some were on theme by their very nature like Call of Cthulhu, Dread, and Ghostbusters. Others had appropriately themed scenarios, despite not being creepy themselves like D&D, DCC, Star Wars, Shadowrun etc. This year I got to play in both a Dread and a Ghostbusters game. If you are looking for something appropriate for the holiday to do with your gaming group this year, I would highly recommend checking these out. First up: Ghostbusters. T he version we played is still basically the version that West End Games released in 1986. It has been out of print forever, but thanks to the magic of the internet you can find all the files you need at Ghostbusters International. Thanks to the Nerdy Show running a podcast called Ghostbusters Resurrection, they have produced updated equipment decks and ghost dice, as well as some updated and expanded rules. The system is d6-based and very easy to pick up. You can play one of the iconic ghostbusters from the original movie, or do what we did and play yourself. There are only four traits in the 1986 version: Brains, Muscles, Moves, and Cool. Each is assigned a number from 1 to 5, and you have 12 points total to spend between the four traits. Each trait has talents associated that are more specific. For instance, Venkman’s talents are Parapsychology, Brawl, Seduce, and Bluff. These each have a number associated with them that represent the number of d6 you roll when testing that skill. Once you declare an action, the GhostMaster has you roll the number of d6 associated with the appropriate trait and (if applicable) skill. If your total is higher than the target number the GM sets, you succeed. There is a twist in the form of the Ghost die. One of your d6s for any check must be a ghost die. If it results in the iconic ghostbuster symbol, something bad happens. If you come up with a ghost but beat the target number you still succeed but with a complication. For example, you are deploying a ghost trap, but you step on the switch sideways and now it is jammed open and must be manually shut. If you roll a ghost and fail the check, you fail with a complication analogous to rolling a 1 in D&D and similar systems. Your character also has brownie points which you can spend to add extra d6s to a check. You can also earn brownie points at the GMs discretion. Once you earn 30 you can increase one of your traits by one. Equipment is handled by the equipment deck. Your character can only take 3 cards with them on any job so choose wisely! This is a fun way to deal with encumbrance and allow your busters to make smart, or at very least hilarious, choices about gear. Our intrepid GM for Scarefest did some research about local spooky events in Asheville and based our scenario around Highland Hospital and the tragic death of Zelda Fitzgerald. Doing a little bit of research about local ghost stories or tragedies in your area can add a lot of local color to the game. I would highly recommend throwing a few bucks at the Nerdy Show to pick up an equipment deck and ghost die from their starter kit and get to busting ghosts! Next up: Dread. This is an RPG that uses a Jenga tower for action resolution. Diceless RPGs can elicit opinions from both fervent supporters and detractors, but stick with me (pun intended). Dread starts with a questionnaire for players that allow them to decide attributes about their character. Questions like: What is your most prized possession? Describe the last time you were bullied. How did you react? What is your biggest fear? What was your proudest moment? All of these questions are not about the player themselves, but the character they wish to portray for the scenario. Once the Host (GM) has read the questionnaires and taken a few notes on each, the game begins. 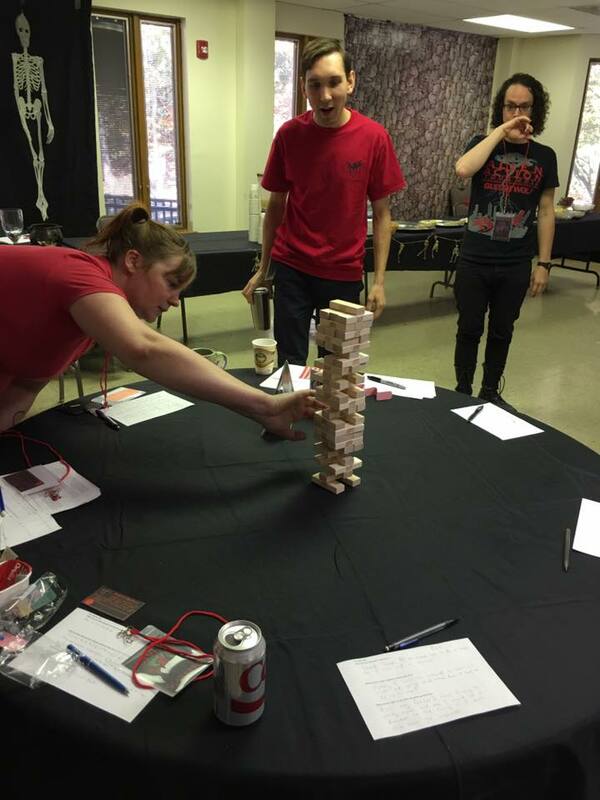 When players take an action that may be challenging or is thematically interesting if they fail, the Host may ask that character to make a pull from the Jenga tower to succeed. Jumping across a pit? Using an improvised weapon to fend off an enemy? Attempting first aid without supplies? All are good opportunities for a pull. Our Host also used this for perception if something was unclear. He would tell the character what they think they saw, and a pull would give them more information or certainty. If the tower falls, your character dies. Potentially, the characters could be incapacitated or removed in some other way, but most typically the consequence is death. As one might expect, this is very easy early on in the game, and becomes increasingly difficult as the game goes on. Several scenarios are included with the RPG itself. We played one called 13, in which we were kids at a sleepover that woke up in an old strange house. The house had no windows, and seemed to be very old. Events got quite a bit creepier from there, seemingly just as the Jenga tower grew more unstable. As we made a pull, the host would usually be right over our shoulder whispering about our character’s insecurities or just about the stakes of the action itself during the pull. This really heightened the atmosphere and added to the tension in the game. Once one character was eliminated, our Host made several pulls to keep the danger level appropriate for the time we had remaining in the game. In the Rules As Written, remaining players take turns making pulls removing 3 blocks for each character that has been removed so far. Characters may also make a heroic sacrifice and, with the Host agreeing it would be appropriate, push the tower over on purpose. Unlike accidentally collapsing the tower, the character succeeds at their task, but is still eliminated from the game. I highly recommend this game for this time of year, but it could be fun any time you and your gaming group wants to have a tense, horror-themed game. The entire table couldn’t help but cheer at precarious, successful pulls and cry out in anguish as the tower finally fell. When is the last time your entire table cheered or screamed at a die roll? Pick up the 167 page PDF for $12 or soft-cover book for $24 plus shipping. Pick up a Jenga tower, and have a very memorable game night! I’ve run into the GBI people at local cons. ALWAYS fun seeing their cosplay and equipment! Cool! I would definitely recommend Dread – not possible on Roll20, but really a great experience in meatspace. I would be interested to hear how you guys manage the “ghost die” mechanic online. The deck and dice I ordered arrived really quickly, and the ghost dice are very cool indeed. I would recommend picking up a few, as one is required for every check for both GM and players.